C++ and native programming stories. The C ++ 17 standard consists of almost two thousands pages. Two thousand pages describing every single aspect of the language. Some pages relates to all kinds of details, exceptions, and things that you do not care about every day. We will try to look at a few such cases, which we hope never see in the production code. The Code Works the Way it’s Supposed to Work. Wojtek is a Senior C++ developer at Thaumatec, currently writing software for a robot. He enjoys reading C++ Standard before bed, and he loves to hate JS from dawn to dusk. If you know Polish, take a look at cpp-polska.pl where Wojtek is one of the co-authors. That’s right, unfortunate! The C++ Committee doesn’t like to change things that break backward compatibility. Actually, the community doesn't like it either. There are small exceptions - such as removing dangerous type std :: auto_ptr, or removingtrigraphs. Unfortunately, things that remember the beginnings of the language still exists in C ++. At first glance - incorrect syntax. But we paste the code into the Godbolt, and it turns out that the program is completely correct. Check it out: godbolt.org/z/S9L-RQ! You can now see that the program will return 1. And again - after all, it’s impossible to index POD types! Literals also don’t have overloaded  operator. It’s impossible for the code to compile. No compilation errors, no warnings. We go to the standard, we read it from cover to cover and… Eureka! That’s why it returns B. Usually, we don’t want to do something like that, but it’s possible. Even if someone declares our container with a simple type, we don’t have to put on the wizard’s hat with big glowing SFINAE inscription. The code will compile and it will be working as expected. And what will a simple type destructor do? Nothing. And thank God! The standard specifies this behaviour as pseudo destructor. The construction looks unusual, but of course it’s completely correct. It may look familiar to C programmers. There is a quite popular optimization called the Duff’s device. After checking the condition, we will enter the do ... while loop to thecase 1 label. The first i increment will happen here. Then the whole loop will be executed twice, so program will output 5. In case if we had n = 5, result will be 9 (the first timei will be incremented after going to the label case 1, then the whole loop will be executed four times). Similarly to the above, the reference was initialized with a temporary variable resulting from the conversion of int tochar. Is the above code undefined behavior? Probably not, since it is in this article. Although we do not know what value &p will be, we know for sure that it won’t be zero (it cannot be initialized to NULL). So the code will print 1 on standard output. This is the chapter “Lexical convention”, paragraph §5.5. That’s easy. Hold my coffee. And you? Do you know any useless constructions that make C++ unnecessarily complicated? 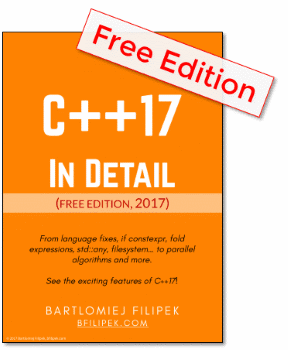 Get my free ebook about C++17! More than 50 pages about the new Language Standard. C++ Links #25 - 75 articles in two months & understanding modules! C++ Links #23 - Top 10 Bugs, Funny Papers and MSVC Performance! Any opinions expressed herein are in no way representative of those of my employers. This site contains ads or referral links, which provide me with a commission. Thank you for your understanding.